The molar entropies of the participants in the reaction M + O2 = MO2 are shown in Fig. 9.2, which is a specialized version of Fig. 3.6. Note that the entropies of the solid forms of M and MO2 vanish at the absolute zero in temperature, as required by the Third law. 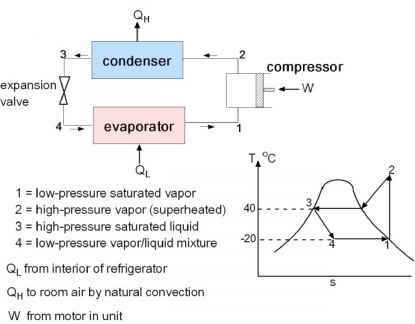 Equation (9.11) does not apply at very low temperatures where CP becomes strongly temperature-dependent. The discontinuity in the curve for the metal M at ~ 600 K is due to melting. The approximate magnitude and the sign of AS° for any nonaqueous reaction can be estimated by ignoring the condensed phases and noting the number of moles of gaseous species in the product and reactants. Each of these species can be assigned an entropy of200 J/mole-K. Example: For O2 at 300 K, Eq (9.13) gives so = 152 J/mole-K. The value obtained from the O2 curve in Fig. 9.1 is ~ 190 J/mole-K. The discrepancy is due to the contributions of the internal modes of motion in the oxygen molecule, which are not accounted for in Eq (9.13). Nonetheless, Eq (9.13) is close approximation to the total entropy of a gaseous species. 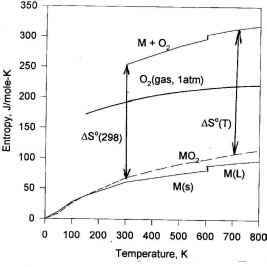 This equation shows that the so varies only slowly with M and T. For the M + O2 = MO2 reaction, the rule of thumb gives ASo = -200 J/mole-K. Figure 9.1 shows that ASo varies from -180 J/mole-K at 298 K to -200 J/mole-K at 700 K.